Hi guys! So sorry for my absence on the blog lately. I know it's been quite a while since my last post so I guess we still have a lot of catching up to do, starting with a travel diary including recommendations regarding one of the prettiest cities in Italy. Staying in Firenze during three full days last summer was a great experience. My boyfriend and I were overwhelmed (not only by the summer heat but also by its beauty) and absolutely loved everything about the city - from its gorgeous architecture and pieces of art unto the local food culture including the most amazing Italian ice cream flavours one could ever imagine. Must say all of my wildest ice cream dreams came true here, and at a certain point we even ate three big ice creams a day (almost had to go to rehab after we got back home). Some of my absolute favourites regarding ice cream parlours, take-away lunch spots and restaurants are listed down below. Hope you will be able to use them some day - enjoy! One of my absolute favourites: they truly served the best cheesecake ice cream we've ever had (also important: in biiiiig portions). Delicious gelateria - located close to the Ponte Vecchio. Another great place for a refreshing ice cream at the river side. Edoardo produces and serves only biological ice cream (with an incredible taste), including special crunchy homemade cones. And since this place is located right next to the impressive Duomo you have the perfect excuse to enjoy some ice cream while waiting in line for the Dome entrance. Absolutely delicious ice cream, but a bit more expensive than the others. Still worth a visit though. 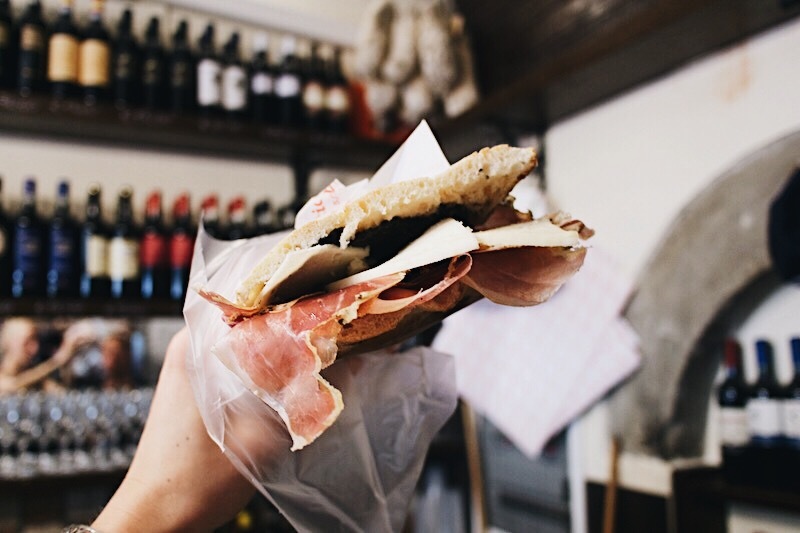 For a delicious glass of vino and simple prosciutto crudo sandwiches on the go this is your place to be. In case you are in for a more delicate type of sandwich you should definitely order one of All'antico Vinaio's focaccia specials. My favourite included truffle tapenade, prosciutto crudo and white cheese (like you can see on one of the photos above): the best sandwich ever. Unfortunately we only discovered this tiny local restaurant during our last evening in Firenze, since we had absolutely loved to try more dishes from their delicious menu. Great Italian food served in a good local atmosphere. Pizza, pizza, pizza. Do I need to say more? Some of the best ones we had during our trip through Italy. Il Chicco di Caffe is a bit more further from the city centre than the above places, but they offer an enormously tasty range of dishes and tapas. A good alternative if you've already had enough pizza and pasta. What a beautiful city! Lucky girl!